Gorham, S.W. and Francis R. Cook. "Salamander". The Canadian Encyclopedia, 04 March 2015, Historica Canada. https://www.thecanadianencyclopedia.ca/en/article/salamander. Accessed 22 April 2019. Salamander is a common name for most members of the tailed amphibia (order Caudata). The lizard has dry skin, scales, an ear opening behind the head, claws, moveable eyelids and five toes on all four feet. The salamander has moist skin, no scales, ear opening or claws, barely moveable eyelids and five toes on the hind feet and four on the fore feet (artwork by Jan Sovak, 1989). 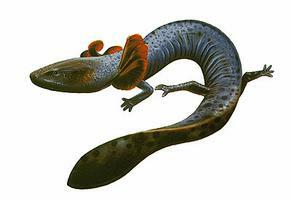 One of the largest salamanders in Canada is the 43 cm aquatic mudpuppy (Macmillan Illustrated Animal Encyclopedia). In Canada, salamanders occur from the Maritimes to BC and north to central Labrador and northern BC (Corel Professional Photos). Salamander is a common name for most members of the tailed amphibia (order Caudata). About 410 species are known worldwide; 21 are native to Canada. Salamanders are found mainly in the temperate regions of the Northern Hemisphere and tropical South and Central America. In the latter, salamanders have radiated and the region contains more than a third of the species in the world. In Canada, salamanders occur from the Maritimes to British Columbia and north to central Labrador and northern British Columbia; none have been recorded from the island of Newfoundland. Salamander species vary in size, from 3.9 cm to 180 cm. One of the largest salamanders in Canada is the 43 cm mudpuppy (Necturus maculosus); the smallest is the 5-9 cm 4-toed salamander (Hemidactylium scutatum). A Chinese giant salamander lived in captivity 52 years and certain species of newts 30 years; however, the life span of some of the smaller species may vary from one to a few years. Most salamanders resemble lizards and are sometimes erroneously mistaken for them. However, salamanders lack scales and claws and have moist, glandular skin; true lizards are reptiles and have claws and dry, scaly, cornified skin. 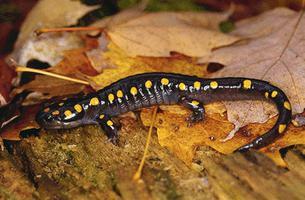 All adult salamanders found in Canada have 4 legs; 3 species in the southeastern US have front legs only. Hence, salamanders differ from the limbless, tropical caecilians of the amphibian order Gymnophiona. Salamanders have tails, and teeth in both jaws; thus, they differ from the third group of amphibians, the frogs, which lack tails (as adults) and lower teeth. Salamanders can sense vibrations but are unable to hear. They are generally voiceless, although some utter faint squeaks. Salamanders have 2 nostrils connected to the mouth, eyes often with movable lids, a mouth with fine teeth, a tongue often protrusible, a skeleton largely bony, a 3-chambered heart with 2 auricles and one ventricle, and body temperature dependent on environment. They breathe by gills, lungs, mouth lining, and skin, sometimes in combination, sometimes separately. Members of the stream, spring, and damp woodland dwelling family (Plethodontidae) lack lungs and breathe through the skin and mouth. Fertilization may be external or internal (internal in all Canadian species). When internal, the male deposits jellylike capsules of sperm; the female picks them up in the lips of the cloaca (chamber through which eggs pass). The eggs are fertilized as they are expelled. All Canadian species lay eggs, the number laid and incubation period varying with each species. The mudpuppy, which spends its entire life in water, lays its eggs under stones where they are guarded by the female. Adult and larvae red-spotted newts (Notophthalmus viridescens) live in water, but in most parts of their range after the young grow legs they loose their gills, leave the water and spend a year or more on land. At this stage, they are referred to as "efts" At maturity, they return to ponds to breed. In the lungless salamanders, some lay their eggs under stones in water (two lined) or in moist places along brooks (dusky and spring); others lay in sphagnum above woodland pools (four toed), or in damp, rotted logs (redback, wandering and Ensatina). Mole salamanders (family Ambystomatidae) deposit eggs in ponds in a jellylike mass attached to vegetation. Some species go to ponds, ditches and lakes in early spring to lay eggs, while stream and woodland species may not deposit until summer. Water-hatching young breathe through gills and may retain these for several years before transforming into land dwelling adults. In a few species under certain environmental conditions (eg, tiger salamander (Ambystoma tigrinum) and red spotted newt), the larval gills are retained after maturity and these adults remain in the water. 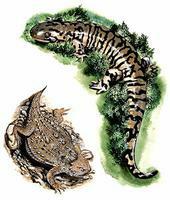 A complication in species recognition where ranges overlap occurs with Ambystoma species: laterale will hybridize with both jeffersonianum and texanum, and the laterale X texanum hybrid in turn interbreeds with tigrinum where it occurs on US islands in Lake Erie, just south of Canada. All crosses produce triploids (ie, containing an extra set of chromosomes), which are most often female and mate with males of either parent species but usually produce solely triploid females like themselves. Some crosses produce diploid (ie, normal number of chromosomes or even tetraploids or pentaploids). The mixing is further complicated by the hybrids having mitochondrial (ie, outside the cell nucleus) contribution from yet another salamander, A. barbouri, which does not occur in Canada and represents a postglacial hybridization before the line spread north. Since they are unable to survive freezing temperatures and must burrow in the earth or under leaf litter where frost does not penetrate, terrestrial salamander species hibernate during colder months. Most aquatic species are probably active year round. Most nonaquatic salamanders are active at night, usually during wet or damp periods; dry air and warm sun would quickly dehydrate them. During the spring breeding season, mole salamanders may be found moving at night across highways to ditches and ponds, where they can be observed with the aid of a flashlight. If sticks or rocks are gently turned over along or in a rocky brook or around a spring, stream salamanders and spring salamanders may often be discovered. If moss is carefully removed from rotted logs and stumps, woodland salamanders can be found in moist, wooded areas during the day. All salamanders are carnivorous: larger ones consume earthworms and adults and larvae of many insects; smaller species eat small insects, insect larvae and various small invertebrates. 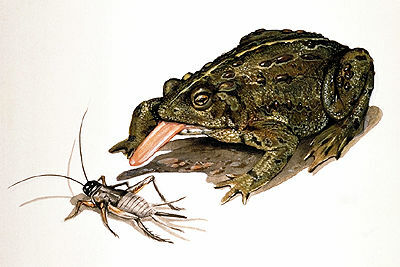 Larvae eat tadpoles, smaller salamander larvae and aquatic invertebrates. Salamanders are probably beneficial to forestry and agriculture as they consume injurious insect pests. 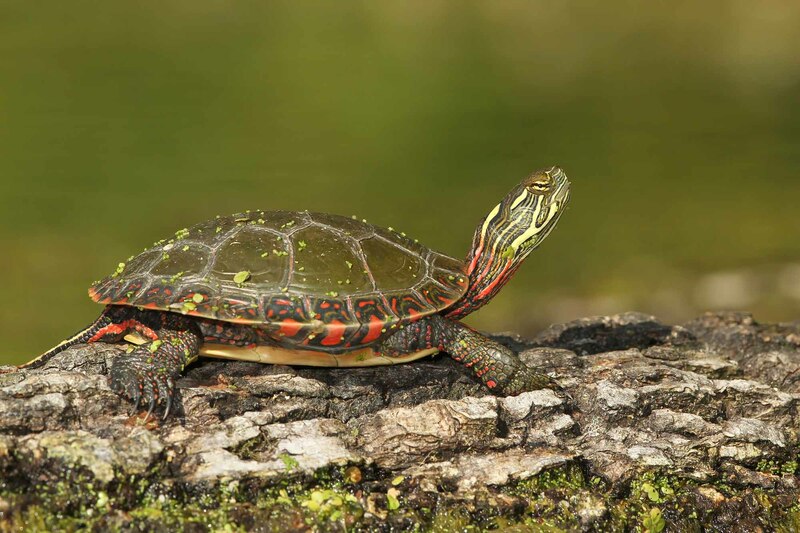 Fishes, frogs, snakes, turtles, birds and mammals are natural predators. When caught, many salamanders are able to break off their tails. The tail continues to twitch for a short time, allowing the salamander to escape as the pursuer is decoyed into seizing the tail. Salamanders are able to regenerate the tail, but the regenerated part is usually shorter than the original. Most species have mildly poisonous glands in the skin that can cause irritation to some animals; newts, particularly the western species, have strong secretions. Salamanders are collected each year by scientific institutions for research and by individuals for terrarium pets. Mudpuppies are taken for use in university and high school biology courses; their capture is regulated provincially. Several species of salamanders are considered at risk because of low numbers and restricted habitats or range, and are protected by law.